Long time since I posted here! It would be longer still, but I feel the need to take to the blog as Sony’s website (and it’s flagship Vaio Pro 13 Ultrabook) have let me down to the point where there is nowhere else online to turn. So I moved on to Sony’s Contact Us page. It asks for your device’s serial number, which despite repeated checks and re-entry, weren’t recognised for my device. No worry, you can persevere without it. So I completed the contact form, including the error produced by the Returns system and my original complaint. Submitting the form, I am greeted by a “Sorry, we can’t find the page you’re looking for…” message. At this point, I’m getting a bit irritated. I go to the Sony.co.uk forum, which at least uses the same login as the My Account section, thinking that I will post my experience on there to get a response. Except you need to choose a username – no problem, stick in the usual suspect for such things, and then: a 403 Forbidden error. Not even dressed up, just the stock Apache Tomcat error page for access forbidden. So after trying three different ways of interacting with Sony online to make my issues with their faulty product known, I have run out of options, hence this blog post. I will be tweeting Sony UK in the hope someone picks this up. Meanwhile, I strongly discourage anyone from buying a Vaio Pro 13 as they are fundamentally flawed and no patch can fix an antenna in the wrong place. I’m pleased to say that the eBusiness Club have given me a special discount price of £150 +VAT for the Search Engine Optimisation: Getting Started workshop that I’m delivering this Thursday 1st November in Nottingham. This applies to non-Chamber members, saving you £50 on the normal price. For full details of the event, click here. If you would like to book a place, please email sharon@ebusinessclub.biz and say that you would like to claim the Ian Lockwood discount for Thursday’s workshop. Please note that the discount only applies to the SEO workshop on 1st November 2012. The workshop is a great introduction to the world of search engine optimisation, with practical tips to improve your website’s SEO and completely up to date information about what works and what doesn’t for SEO in 2012. Whether you’re planning on doing your own SEO, or thinking about paying for SEO services, this workshop will ensure that you make the right choices in who does it and how it is done. I’m pleased to announce that the eBusiness Club has a new series of events lined up, starting with “What’s New In Search”, delivered by me! The first place that I’m delivering this new briefing is in Chesterfield at the b2Net Stadium on 4th May, followed by the Nottingham Belfry on 15th June and Derby Pride Park on 6th July. I’ll be covering topics such as the ongoing Google Panda updates, the importance of social media in search results (particularly Google+), new features in search results such as Rich Snippets, Google’s recent attack on “unnatural links” and changes in the pay per click arena. Places are only £25 +VAT, which includes breakfast and time for networking either side of the presentation. Note that the briefings have a new, earlier start time of 7:30am registration for an 8am start. There is a small amount of funding for full-day workshops still available in Chesterfield, Derby City and Corby areas. Keep an eye on the full list of events at the eBusiness Club website, not least as there will be new events announced very soon, including “What’s New In Social Media” and an in-depth briefing on Google+. New full and half-day workshops for paying delegates (discounts for Derbyshire & Nottinghamshire Chamber members) will follow hot on their heals! I’ve just written a new post over at our company blog, Boom Online Marketing, about how the DVLA Registrations website has moved to a sub-domain of direct.gov.uk and is benefitting from its domain authority at the expense of competing companies. If you haven’t already, I recommend subscribing to the Boom blog/newsletter as it’s kept far more up to date than my own blog here! 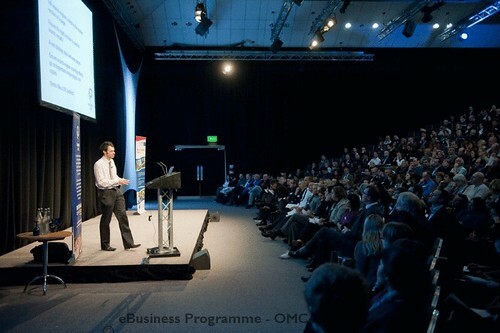 I’m pleased to say that the eBusiness Club will be running its fifth Online Marketing Conference. Some of you will know that I spoke at the last one, and if you visit the conference page here, you can book your place, as well as rather embarrassingly see me in action! There are a couple of great keynote speakers this year and I will be doing my bit too delivering a “What’s New In Search” session along with website reviews and sitting on the Experts Panel, so I hope you can join the hundreds of other East Midlands businesses and take advantage of this great (free!) opportunity. I read a good post on Search Engine Watch today about the possible effects of Google’s new URL shortener, http://goo.gl – similar in essence to Bit.ly and all those other URL shorteners people use to post links on Twitter, Facebook etc. The article suggests that Google has very good reason to promote this service – it offers Google another way of measuring what people “like” on the web, even when they don’t have a website of their own from which to make links. That means that whilst traditionally, links from websites have counted as “votes”, not many web users actually had their own websites from which to link. Being able to track what users of social media sites are linking to adds a significant amount of web users to those empowered to “vote”. Not only that, but because you’ll be logged in to your Google account, Google may well have some demographic data to associate with the link you’re making. And of course, Google can aggregate all the links being made through Goo.gl and get a picture of “what’s hot”, enabling it to inform its search results better when people are searching for related topics. I spoke to a nice chap called Sam at the Applegate Directory today, who very kindly offered to give all my blog readers, Twitter followers and anyone else who cares to ask a 30% discount off their new Mercury Listing. Clearly this is pretty handy for SEO, and you can see how it’s being used by some companies here and here. I have found Applegate to be quite handy for several of my clients, although I’m not guaranteeing it is the right thing for everybody – depends very much if you have the kind of business suited to that directory (primarily business-to-business), although the SEO benefit of lots of keyword-rich deep links to your site from a PageRank 6 domain can’t be denied for any type of website. The cost? Usually £595 +VAT, but with the 30% discount, £416.50 +VAT. Note that you can’t get this online – you will have to call Sam on 01271 852 000 and quote reference IanLockwoodSR2. Please feel free to Tweet, email and generally spread this discount code to anyone you think would benefit, it isn’t dependent on knowing me personally! I’m pleased to announce that along with my good friend Ann Stanley of Anicca Digital Solutions, we are delivering Figaro Digital magazine’s Digital Marketing Academy. This is a series of training workshops, held at London’s rather swish Hospital Club, based on the Customer Acquisition, Conversion & Retention model. The workshops will provide a holistic view of how to use online marketing techniques to achieve each of the stages in the customer buying cycle, so you can expect to learn about SEO, PPC, Analytics, conversion rate optimisation, social media and email marketing. You can pick and mix from the days on offer at £495 per day, or take all four days at a discounted rate of £1485, giving you one day free! Click over to the itinerary here to understand more about how the Digital Marketing Academy can help you. Warning: There is a mugshot of me further down that page!